First of all, you need to know, it won’t bear any resemblance to what is commonly known as a “Taco Bar”. We aim to keep our traditions and culture alive and that includes the food we serve! So, what will you find? Get ready! First of all, you will be pampered with Handmade Corn Tortillas, if you haven’t tried them, you are in for a treat! Please remember that if you prefer Flour Tortillas, you just need to ask. Then there are the classic Mexican sides: Rice and Beans. That is, Mexican Style Rice (done with tomatoes for a tangy flavor) and Refried Black Beans, yum! Other sides include Rajas Con Crema (poblano peppers –non spicy- cooked in cream with corn grains), Calabacitas (boiled zucchini), Papas Con Chorizo (chorizo with potatoes, chorizo being a Spanish type of sausage with a paprika flavor). 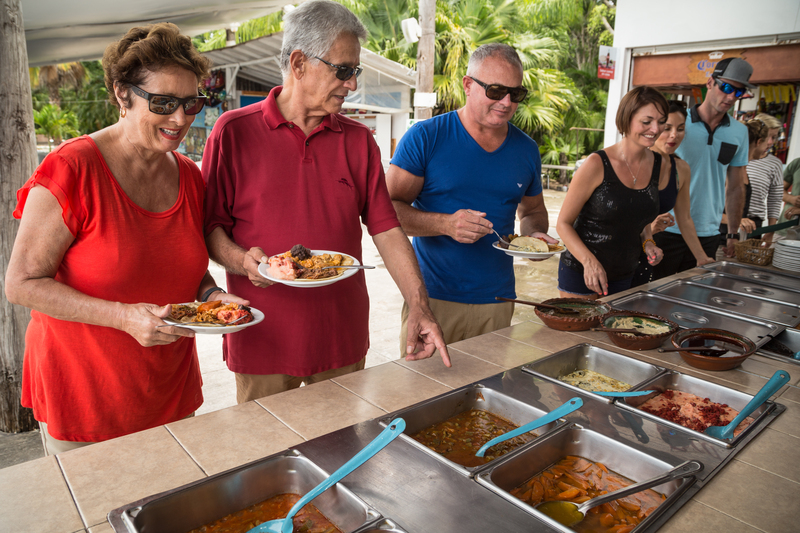 Now, for the main courses, you will sample authentic Mexican dishes. First there is Tinga de Res (shredded beef in tomato and chipotle sauce with thinly sliced onion) and then there is Cochinita Pibil, which really is the star of the buffet. This typical pork based dish is marinated in a combination of sour orange juice and annatto spice mix. It is then slow-cooked overnight to produce a super- tender meat that is full of flavor. Don’t forget to add some pickled red onion to your Cochinita Tacos, which is the original Yucatan peninsula way of eating them. Remember to give the salsas a shot if you feel brave, be careful with the Habanero one though, there is a reason why even locals drip just a tiny bit of on their tacos, it is seriously hot! There are other two salsa options that are milder, one being a tomato-based, which is the mildest, and then a medium range made of chile de árbol and olive oil. Check out if your tour includes the taco buffet, and if it does not, make sure to add it either online or once you are here. You won’t regret it!